The French Riviera is home to some of the world’s biggest yachts, finest restaurants and stylish coastal cities, but it is also home to some of the most beautiful, historically rich perched villages. In the hinterland of this wonderful region the villages may not receive the same levels of attention garnered by Monaco, Cannes and St Tropez, but they do provide an insight into the history and traditions of the Alpes-Maritimes, in addition to offering incredible panoramic views. Towns such as Eze, Gourdon and St Paul de Vence have all inspired artists to the region over the last few Centuries. With the close proximity of these villages, an early start means you could see them all in just one day, especially if you have the benefit of one of our French Riviera supercar rentals. A tour of some of the most beautiful villages in the area can easily be done in just one day starting from Monaco, below are four of our favourites. First on the list is La Turbie. Located just above Monaco, it offers a fantastic view over the Principality, but aside from this has maintained its ancient defence systems such as the medieval gates, walls and passageways, which make for an intriguing historical tour. The highlight in La Turbie is La Trophée d’Auguste, built in honour of the Roman Emperor Augustus to celebrate the victory of the Alps. The remains tower above everything else in the village. The drive from Monaco to La Turbie is short, but spectacular. A road which snakes up the steep hill between the two, offers views over the Mediterranean at every turn and is every bit as fun to drive as it sounds. From La Turbie it is a short eight-minute drive to the next stop on the tour, Eze. Not to be confused with Eze-sur-Mer which is not much more than a beach, this stunning perched village plays host to a wonderful medieval castle, the immaculately kept Jardin Exotique and one of the finest panoramic views in the area. From the castle, the view stretches as far as the eye can see over St Jean Cap Ferrat and Villefranche, out towards the Mediterranean Sea. It also boasts both Galimard and Fragonard shops selling perfumes created by these two local perfumeries. The roads of the village themselves are windy, but the road towards Nice and the next destination on the perched village tour offers spectacular coastal views and are that much more fun behind the wheel of a luxury car rental. Alternatively you could go towards the A8 motorway and then follow it from to Cagnes-sur-Mer where you can exit and head towards St Paul de Vence. St Paul de Vence is historically an artistic town, its streets lined with galleries selling sculptures, paintings and everything in between. Sit on one of the walls that border the village to admire the view out to sea and you will understand why it became so popular among an artistic crowd. From St Paul you can train your eye over to Villeneuve-Loubet and Cagnes-sur-Mer, home of internationally renowned artist Pierre-Auguste Renoir in his latter years. There are a number of fine restaurants in the town which range from the traditional home cooked cuisine of the region, to dining experiences with a view. It is the perfect place to stop for a leisurely lunch, or alternatively you can finish the tour and return in the evening, when, during the summer months La Toile Blanche Restaurant is open in the evening. One final perched village to visit is Gourdan, slightly further north of St Paul de Vence and further into the hinterland of the Alpes- Maritimes. 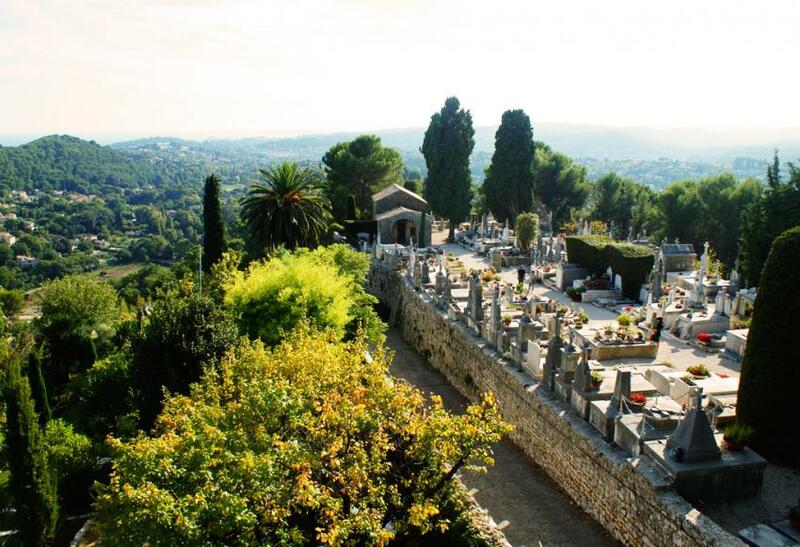 Following the twisting road of the D7 towards the town of Grasse, it is around a 45-minute drive from St Paul de Vence. As the majority of the road is a climb, upon arrival in Gourdon you will be immediately taken in by the stunning view the village offers. Almost impossibly set into the hills, Gourdon is very small and it doesn’t take a long time to walk around, however it is regularly voted one of the prettiest villages in France, a high honour indeed. The view from Gourdon stretches from Nice to Théoule-sur-Mer, coastal towns some 50 kilometres apart, and a peaceful walk around the village can feel like an escape from the occasionally overwhelming coastal resorts. A tour of the perched villages of the Alpes-Maritimes not only offers some of the best driving roads with views you could ever encounter, it also opens up a world of art, history and world-class panoramic views. Do not hesitate to contact us for any more information about the local area, recommended day trips or simply how to rent a luxury car in the region.